1) (London, and Ripon, co. York). Az. on a saltire or, betw. four bezants a leopard’s face of the field. Crest—A demi griffin az. collared or, holding a bezant. 2) (Thicket Priory, co. York). Quarterly, 1st and 4th, gu. a griffin sejant, wings endorsed ar. a border engr. of the last charged with eight pellets, for Jefferson: 2nd and 3rd, paly of six ar. and az. on a chief gu. a bezant betw. two annulets or, for Dunnington. Crests— 1st, Jefferson: A griffin, as in the arms, gorged with a collar gemel az. in the beak a lily slipped ppr. ; 2nd, Dunnington: A horse courant ar. gorged with a collar gu. charged with a bezant betw. two annulets or. Motto—A cruce salus. 3) (Ven. Joseph Jefferson, M.A., F.A.S., Archdeacon of Colchester, d. 1821). Az. a saltire or, betw. four bezants. Crest—A demi griffin segreant az. holding betw. the claws a bezant. 4) (York) Gules, a griffin sejant, wings endorsed, argent, within a bordure engrailed of the last, charged with eight pellets. 5) (Dullingham, co. Cambridge; seated there since the year 1656). Az. a fret ar. on a chief of the last three leopards’ faces gu. Crest—A talbot’s head erased ar. eared gu. There are several ancient Germanic personal (first) names that may have coalesced to give rise to the English masculine given name Geoffrey or Jeffrey, of which Jefferson is the patronymic/baptismal (“son on”) form. First, during the Norman Conquest of 1066 AD, the French name Jeufroi (or Jefroi) appeared in England, where it became Anglicized to Geffrey. Second, it may be tied to the Teutonic personal name Godfridus, whence also Godfrey. In Domesday Book, it is spelled Goisfridus (meaning “God’s peace”, deriving from Gaufrid and Galfridus). 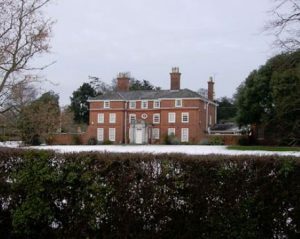 One source asserts the family first held land and titles in county Herefordshire, England. Some spelling variants or names with similar etymologies include Jeafferson, Jeffereson, Jeffreson, Jeaffreson, Jefferyson, Jeffersonn, and others. The earliest known bearer of this last name was Robert Geffreysone who was documented in the Assize Court Rolls of Staffordshire England in 1344 AD. Others include Alice Geffrason who was listed in the Register Guild of the Corpus Christi in York in 1488 AD and John Jeffrason whose name is contained in the Register of the Freeman of York in 1528. The lineage or ancestry of this branch of the Jefferson family tree traces back to Christopher Jeaffreson, Esquire of Dullingham, Justice of the Peace, and Member of Parliament born in 1699. He married Elizabeth, daughter of Sir John Shuckburgh, Baronet of Shuckburgh, and had a son and heir with her also named Christopher. This Christopher Jeaffreson was an Esquire of Dullingham who married Sarah, daughter of Francis Dayrell Esq. of Shudy Camps, and had a daughter with her named Sarah Elizabeth and a son named Christopher. The son and heir Christopher was a Lieutenant General in the army and Colonel of the Cambridgeshire local militia. In 1794, he married Harriet, Viscountess Gormanstown, daughter of John Robinson of Denston Hall, and had had a daughter with her named Harriet. This Harriet Jeaffreson was the heiress and in 1827 she married William Piggott, having the following issue with him: Christopher William, Ada (married John Dunn Gardner) and Harriet. The son Christopher William Jeafferson was an Esquire of Dullingham House in Cambridge, England who was born in 1836. Samuel Jefferson had a son named John Jefferson I. He married Elizabeth and had a son with her named Samuel. This Captain Samuel Jefferson Sr. was born in Pettistree, Suffolk, England in 1584. He married Elizabeth Carr in 1606. He went to the West Indies aboard the Hopewell. He had at least three children: Samuel Jr., John, and Susan. His son Samuel Jr. was born in Pettistree, England in 1607. He married a woman named Elizabeth in England in 1628. He died in 1690 in Antigua and Barbuda. He had a son named Thomas. This Thomas Jefferson Sr. was born in St. Christopher, British West Indies, around 1640. He went to Henrico County, Virginia, where he married Mary Branch in 1677. They had three issue together: Mary Field (Harris), Thomas II, and Martha (Wynne). His son Captain Thomas II was born in Colonial Virginia in 1679. He married Mary Field and had the following issue: Judith (Farrar), Thomas III, Peter, Martha (Goode), and Mary (Turpin). His son Colonel Peter Jefferson was born in Osborne, Chesterfield, Virginia around 1708. He married Jane Randolph and had the following children with her, one of which was President of the United States: Jane, Mary (Bolling), Thomas, Elizabeth, Martha (Carr), Peter Field, Lucy (Lewis), Anna Scott, and Randolph. President Thomas Jefferson was born in Shadwell Planation, Virginia Colony in 1743. He married Martha Wayles in 1772 and had the following issue with her: Martha (Randolph), Jane (Randolph), Mary (Eppes), Lucy Elizabeth, Beverly William Kemmings, Harriet (Hemmings) Heckman, Madison James Hemmings, and Eston Hemmings. John Jefferson was recorded as living in Virginia in February 1623. He came to colonial America aboard the Bona Nova around 1620. He owned 250 acres of land in a place called Archer’s Hope. Other settlers in colonial America bearing this surname include James Jefferson (Virginia 1638), Robert Jefferson (Virginia 1639), Robert Jefferson (Virginia 1639), Alice Jefferson (Virginia 1648), Mary Jefferson (Virginia 1653), Edward Jefferson (Virginia 1704), Weldon Jefferson (Virginia 1704), Frances Jefferson and (Virginia 1711). In Canada, one of the first settlers bearing this last name was Robert Jefferson who landed in Nova Scotia in 1774. In Australia, a family of this name landed in Adelaide in 1851 aboard the Prince Regent. The father was Francis Jefferson (age 42), along with his daughter or wife Anne (age 25), and children Thomas and Mary. In New Zealand, a husband and wife, Benjamin and Sarah Jefferson, ages 25 and 37, respectively, came to Port Nicholson aboard the Lady Nugent in 1841. Charles Bolton’s American Armory (1927), Matthew’s American Armoury and Bluebook (1907), and Crozier’s General Armory (1904) do not contain any entries for the Jefferson last name. I have identified one Jefferson family motto: A cruce salus (Salvation from the cross). This is an allusion to the cross depicted in the family coat of arms. There are hundreds of notable people with the Jefferson surname. This page will mention a handful. 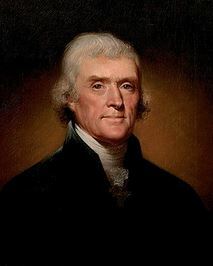 Famous people with this last name include: 1) Thomas Jefferson (1743-1826) who was one of the most prominent American Founding Fathers who served as the 3rd President from 1801-1809, the 2nd Vice President (from 1797-1801), the first Secretary of State, Minister to France, delegate to the Second Continental Congress, 2nd Governor of Virginia (1779-1781), and a signer of the Declaration of Independence, who was born in Shadwell, Colony of Virginia, son of a planter and surveyor named Peter and his wife Jane Randolph, 2) Wallace B. Jefferson (1963) who served as Chief Justice of the Texas Supreme Court from 2004-2013, 3) Jesse Harrison Jefferson (1949-2011) who was an American Major League Baseball pitcher who played for 5 different teams (ex. Baltimore Orioles and Toronto Blue Jays) from 1973 to 1981, 4) John Jefferson (1956) who was a wife receiver who plated for three different teams (ex. Green Bay Packers) from 1978-1985, born in Dallas, Texas, 5) Anna V. Jefferson (1926-2011) was the first American-American woman to become state senator in New York, serving from 1983 to 1984, 6) William Jennings Jefferson (1947) who served as a member of the US House of Representatives from Louisiana between 1991 to 2009, 7) Charles Edward Jefferson (1860-1937) who was an American Congregational clergyman who was born in Cambridge, Ohio, 8) Sir Geoffrey Jefferson (1886-1961) who was a British pioneer of the neurologist and neurosurgeon fields, and 9) Arthur Stanley Jefferson (1890-1965) who was an English comic actor known as Stan Laurel born in Ulverston, Lancashire, England, and who was one of the comedy duo Laurel and Hardy. Three of the main heraldic symbols depicted within the Jefferson Coat of Arms (incorrectly referred to as the Jefferson Family Crest or Jefferson Family Shield) are the saltire, bezant, and leopard’s face, each which have their own unique meaning. The primary tincture (color) is azure (blue), which signifies loyalty, truth, faith, strength, and chastity. However, the following caveat should be mentioned: some heraldry experts believe a great deal of the symbolism of heraldry is more so a romantic invention of the Victorian era as opposed to truly historical. The saltire is one the major ordinaries, large charges that occupy the whole of the field. Arguably one of the best uses of this device is that of the St. Andrews Cross, a white saltire on a blue background found on the Scottish flag. The saltire is obviously closely related to the Cross, and Wade in his work on Heraldic Symbology suggests additionally that it alludes to “Resolution”, whilst Guillim, an even more ancient writer, somewhat fancifully argues that it is awarded to those who have successfully scaled the walls of towns! For easy recognition of the items on a coat of arms, and hence the quick identification of the owner, bold simple shapes are best. Hence, simple geometric shapes are often used for this purpose, and the bezant Is a typical example of this, and in British Heraldry always takes the tincture or. It shares the same root as the name Byzantium, being associated with the gold coin of that city and indeed, in some heraldic traditions is represented as a coin-like disk in perspective. Wade suggests that the use of this device refers to ”one who had been found worthy of trust and treasure.” This symbol is similar to a roundle. The leopard’s face (sometimes, incorrectly referred to as a leopard’s head) occurs very frequently in heraldry. Early heraldic artists tended to treat lions and leopards as the same animal, but during the development of British Heraldry the heads of the two creatures have adopted separate, and more realistic forms. Wade would have us associate leopards with warriors, especially those who overcome “hazardous things by force and courage”. In ancient Egypt, priests wore leopard skins to ward off evil spirits. In ancient Greece, the god Dionysus is often depicted riding a leopard and/or wearing its skin. In ancient times, the leopard was called “the Great Watcher” as the many spots represented eyes.